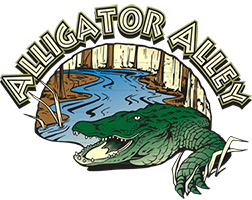 Alligator Alley is located in Summerdale, Alabama and is home to over 450 alligators. In 2004 owner of Alligator Alley Wes Moore, opened the alligator farm as a rescue Alligators who were found in dangerous places. These animals have lost their natural fear of humans and are considered “nuisance animals” and have been moved to Alligator Alley. guided adventure and walking tour on an elevated viewing platform, hold a baby alligator, feed alligators at feeding times, see over 450 alligators from mature adults to hatchlings. Closed for winter. *Regular park hours will resume in February.